I am taking a very short break from my epic horse gear project, to make a few "Instant Gratification" projects. Yesterday, I made these earrings as a gift for a Crow friend of mine. They are based on Crow Hair Bows - which were a hair ornament worn by Crows and a few other surrounding tribes. They denoted one had slit someones throat in battle, and were not simply worn as a fashion statement in the day. They had to be earned. These were made using old style smooth shell dentillium shells. Sewn on ochre stained brain tan, and mounted on buffalo rawhide. 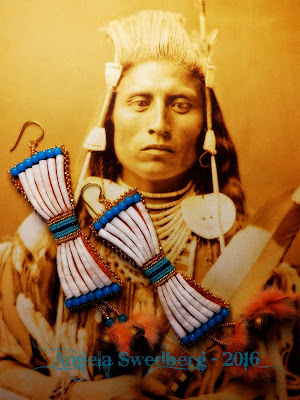 The are beaded with charlotte cut beads and 24 k. gold beads, antique trade beads, and finished with ochre stained ermine skins and very small trade bells. The ear wires are gold vermeil. I might make a few more pairs of these, along with some other small items and put them up for sale if there is interest. So often my work takes many hundreds of hours and ends up being rather costly. So I will offer some things in a far more economical range in a week or two.